heinnews – Can Barrett finally win with Montverde? Will Findlay win No. 4? Is this Oak Hill’s year? Or do we have a Cinderella from Utah? 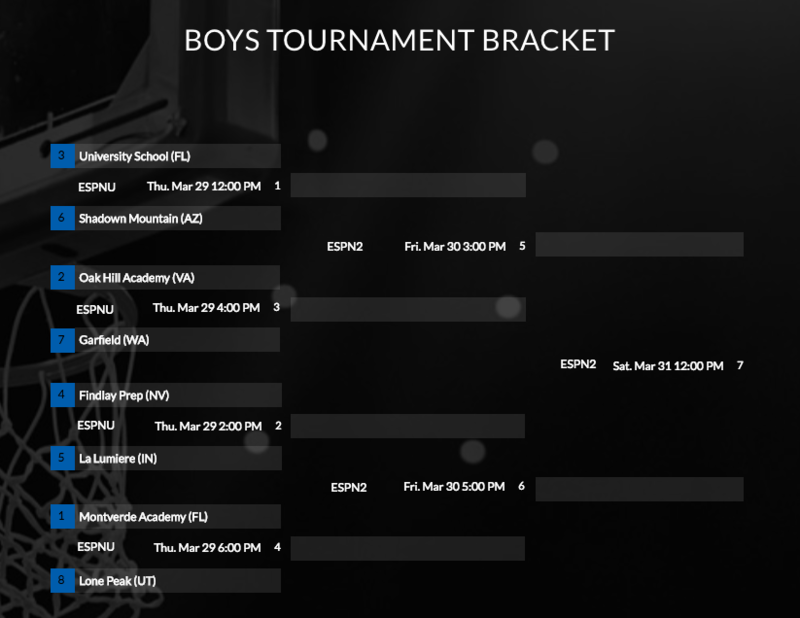 Montverde Academy come into the Geico High School National Tournament as the undefeated top seed and favorite in the 10th edition of the competition. But the three-time champions have been tested this season and they will have the big target on their backs in an eight-team field loaded with talented future stars. Montverde are not the only three-time past champions as Findlay Prep of Nevada won the event in 2009, 2010 and 2012 and will be looking for title number four in their 10th appearance. Oak Hill Academy of Mouth of Wilson, Virginia are back in the competition for a ninth time. Oak Hill captured their only title in 2016 after losing in the final in 2009, 2011, 2014 and 2015. Besides Montverde’s three-peat from 2013 to 2015, the team also reached the final in 2010, 2012 and last season. The only former champion who will not be in New York City from March 29-31 will be 2011 winner Montrose Christian. Back to defend their crown is La Lumiere of Indiana, who knocked off Montverde in the 2017 title game. In fact, La Lumiere also knocked off Montverde in the 2016 semi-finals before falling to Oak Hill. The field is rounded off with first-timers University School of Florida; Shadow Mountain of Arizona, making their second appearance; debutants Garfield High School of Seattle; and Lone Peak High School, a first-timer from Utah. To be eligible for the event, schools must be a four-year high school – independent or public – and their respective governing bodies must give them permission to participate. The eight teams are then chosen by a selection committee. There will be plenty of intrigue at New York’s Madison Square Garden on the weekend of the NCAA Final Four – an event which very well in the near future could see the stars of the Geico tournament. Friday’s action will tip off at noon ET with University taking on Shadow Mountain. University’s only loss all season came against Oak Hill, winning the state title and coming into the tournament ranked second in the nation. The team is led by Vernon Carey Jr, who was the MVP of the FIBA U16 Americas Championship 2017 last summer and is expected to be one of the stars for the United States at this summer’s FIBA U17 Basketball World Cup 2018 in Argentina. They also have highly-rated sophomore Scottie Barnes. But it will not be easy against the Arizona team, which is coached by former NBA star Mike Bibby, who has won three straight state titles and six in total with the school. Shadow Mountain, which are ranked fourth in the nation, only lost one game all season, that coming against Findlay Prep. And Shadow Mountain’s main star is Jaelen House, who has committed to Arizona State and is Bibby’s nephew and the son of long-time NBA player Eddie House. The second game, which tips at 2pm ET, sees the nation’s number three team Findlay Prep against seventh ranked reigning champions La Lumiere. Findlay Prep’s overwhelming leader is the ultra-talented Oregon commit Bol Bol, who is the son of NBA star Manute Bol. Findlay also have TJ Moss as one of their leaders. La Lumiere lost two McDonald’s All-Americans from their title-winning team from last season – Brian Bowen and Jaren Jackson – in addition seeing their head coach Shane Heirman become an assistant coach at DePaul. Pat Holmes took over the team and his main gun is Tyger Campbell with Isaiah Stewart also there to help. The third game will have Oak Hill facing off against Garfield at 4pm ET. Oak Hill racked up a 40-1 record with their only loss coming against Carlisle in January. Oak Hill picked up victories this season against University, La Lumiere and Lone Peak as well as Mater Dei and IMG Academy. Steve Smith’s program is loaded with talent including Keldon Johnson and David McCormack, who will be playing at the Nike Hoop Summit. There is also Keyontae Johnson and Will Richardson. Waiting to trip up Oak Hill in their first appearance is Seattle’s Garfield High, which is coached by former NBA star Brandon Roy. Their only loss of the season came in mid-February against city rivals Seattle Prep. Roy’s main go-to guys are J’Raan Brooks and P.J. Fuller. The night-capper will be Montverde taking on Lone Peak at 6pm ET. 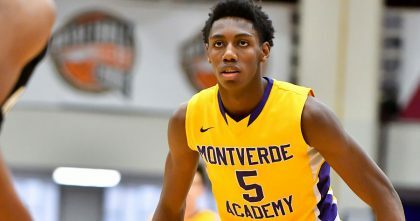 This kind of has the feel of a David vs Goliath with Kevin Boyle and his star leader RJ Barrett so hungry to finally get the trophy back after the three-peat ended in 2015. Montverde, who went through the season undefeated, have loads of star power, topped by Barrett, who heroically guided Canada to the title at the FIBA U19 Basketball World Cup 2017. But this team is so much more than just the Duke commit Barrett. There is fellow Canadian Andrew Nembhard, Mike Devoe, Gonzaga commit Filip Petrusev, Balsa Koprivica and Makhi Mitchell. Montverde have been bent but resisted breaking this season on a couple of occasions. They beat Bayside by just four points and Simeon by two. They then needed a last second three-pointer from Devoe to beat Findlay 69-67 in the final of the 15th annual Montverde Academy Invitational Tournament on January 27. That game featured eight ties and 32 lead changes, six ties and 17 lead changes coming in the fourth quarter alone. And in Montverde’s third-to-last game of the regular season, they needed Barrett to score seven unanswered points in the final 29 seconds to erase a six-point deficit and beat 21st-ranked Roselle Catholic 60-59. All that gives hope to Lone Peak, who are ranked 25th in the nation and have collected nine Utah state championships in just 20 years of existence, including eight in the last 10 years. Their only three losses this season have come against teams in the top 25 in the national rankings – against Oak Hill by three points, versus DeMatha of Maryland between Washington DC and Baltimore and against Bishop Gorman of Las Vegas. Coach David Evans’ main leaders will be Steven Ashworth and Max Brenchley. Here is the bracket for the tournament. There is an enticing possibility of University getting a chance for revenge for their only loss of the season to Oak Hill in the semi-finals, which will be played at 3pm ET and 5pm ET on Friday March 30. The other semi-final could be very intriguing as well. Findlay could have a chance to avenge their only loss of the season against Montverde – the last-second winner by Devoe. Or there could be another showdown between Montverde and La Lumiere after the 2016 semis and 2017 final – both won by La Lumiere. Or we can get a dose of March Madness high school style with Lone Peak taking down Montverde – after all, it will have been 48 days since Montverde’s last regular season game and the contest with Lone Peak.